Dates:AH 1165 / 1751 C.E. 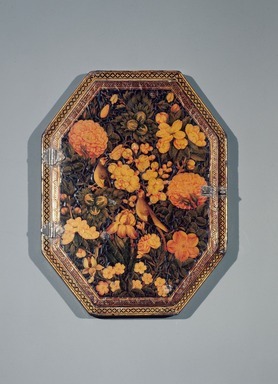 This mirror case bears the allegorical signature of the renowned eighteenth-century lacquer artist `Ali Ashraf: “After Muhammad, `Ali is noblest.” (Exhibit text, Islamic Galleries, June 2009, L. Akbarnia) Octagonal mirror case consisting of a frame and a hinged cover with a mirror. As in most Persian lacquer, this piece is made of papier-mâché and is covered with painted designs against a black ground. The edges are decorated with minute repeated stylized leaf and flower patterns in gold on a black ground.